Brief historySocorex Isba SA is often referred to as just Socorex, the name under which it was first founded in the late 1940's. Two young watchmakers had identified the need for new types of quality syringes for medical applications. The products rapidly met with success internationally. In search for synergies, the company merged with another firm a few years later. Renamed Socorex Isba S.A., the new entity moved to Lausanne on Lake Geneva in 1960. Its growth, particulary in the laboratory field, soon forced the company out of the city to its today's larger, expandable facility in Ecublens, home of the Federal institute of technology (EPFL) and University of Lausanne (UNIL). Products & ServicesToday's manufacturing programme includes a wide variety of high precision instruments used for reliably measuring, dosing, transferring, dispensing and injecting liquids in a large number of applications. Manual and electronic micropipettes, multichannel pipettors, repeater pipettes, dispensers, pipette controllers and re-usable syringes, together with their accessories, constitute the heart of the programme. Each precision instrument bears its own serial number and passes a strict performance control attested by an individual QC certificate. "One stop does all" is the moto of the Socorex Service Center offering a global repair and calibration programme. The choice ranges from basic maintenance to accredited calibrations of all micropipettes and dispensers according to ISO 17025 - whatever their brand. All articles from Socorex Isba S.A.
Socorex is pleased to inform about the launch of its new Qualitix® tipfill system for easy and quick rack filling. It includes a re-closable cardboard box containing prefilled tip inserts. Socorex is pleased to announce the launch of its new Qualitix® tip programme including a selection covering most application requirements. The CalibrexTM bottle top dispensers are robust instruments with excellent chemical resistance. The comprehensive Acura® manual pipette line includes nine multichannel models covering volumes from 0.5 µL up to 350 µL. From the basic unit to the corrosion resistant model, the laboratory syringes are precision instruments intended for safe and reliable liquid distribution. Additional discounts on Ecostep syringes or Ecostep bioproof sterilized syringes. 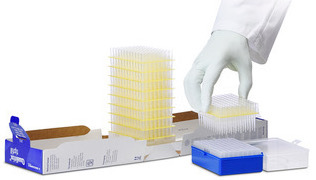 EcostepTM syringes are used in conjunction with the Socorex StepperTM 411 repeater pipette. Socorex releases its 2014 general catalogue marking its company’s 50th anniversary. Two distinct models with dedicated chemical resistance, CalibrexTM organo 525 and CalibrexTM solutae 530 bring performance and flexibility in the laboratory. CalibrexTM organo 525 models with ground glass plunger are best suited for organics, and non-crystallizing solutions. Socorex releases its new 6-position pipette workstation Twister™ universal 336. Now available ! New Acura manual XS micropipettes - a master in metrology Nov 21, 2010 Shorter size, smoother activation, lighter in weight, the eight models offer key features aiming at excellence in pipetting. An optimized shape / size ratio cares for superior drivability. This greatly improves precision of hand movement, especially with micro tubes. Electronic micropipette Acura electro - Touch and go - the easy pipetting mode selection May 20, 2010 Socorex presents a microprocessor-controlled instrument making electronic pipetting simpler and safer than ever. Avoiding complicated programming steps, there is only few buttons on the keyboard to give access to the various modes within seconds. New cost effective pipette packs Oct 6, 2009 The TriopackTM is a ready to use set including 3 Acura® manual adjustable pipettes, sample of Qualitips®, QC certificate and operating instructions. New Socorex catalogue Oct 6, 2009 A major player in precision liquid handling, Socorex releases its 2009 - 2010 catalogue.